Cloudy with showers. High around 65F. Winds NNW at 15 to 25 mph. Chance of rain 60%..
Melting snow and spring rains produce conditions that can increase lameness in beef cattle, according to a news release from South Dakota State University Extension. Mud is among the predisposing causes for cattle lameness, said Alvaro Garcia, director of the South Dakota State University Extension agriculture and natural resources program. Wetness decreases hoof hardness and increases the incidence of claw lesions, he said in a university news release. Research has shown that nearly one-third of the total water absorbed by the hoof happens during the first hour of exposure to high moisture, resulting in heavier and softer hooves. Although not as prevalent as observed in the dairy industry, when it happens it may lead to decreased feed intake, lower weight gains, reduced reproduction (both in cows and bulls) and greater culling rates. Beef producers can address muddy conditions by creating mounds where cattle can lay down on higher, drier ground, Garcia said. There is minimal cost to establish a mound, particularly when the shaping takes place prior to installing fences, bunks, watering and aprons. With a slope of usually 3% to 5%, mounds work best when built parallel to the direction of the slope and located in the center-line of the pen. In older lots these mounds can be newly built or strengthened periodically by adding manure and dirt. Mounds, however, do not last forever and more than likely will need some reshaping with additional material yearly. The main concern is when small rocks or pebbles are present in the material used to build them. Standing cattle apply a significant amount of pressure to any surface. 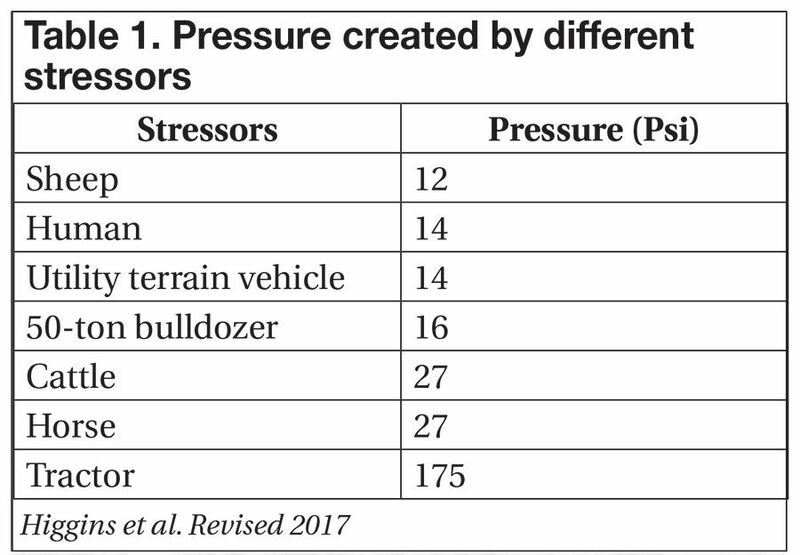 In a 2017 University of Kentucky article researchers compared this pressure with that of other livestock, humans and farm equipment. Pressure was measured in pounds per square inch (psi) or, more accurately, pound-force per square inch — 1 Psi is the pressure that results from a force of one pound-force on an area of one square inch (Table 1). From the data in the table it is obvious that aside from tractors, cattle and horses exert the most pressure per square inch, even more than a 50-ton bulldozer. Producers may be aware of the “action-reaction physics principle,” which states that every action, is followed by an equal and opposite reaction force. For example, if you press a button, the button presses back with the same amount of force. When cattle mounds are not maintained (or reshaped) regularly, rains or any other source of running water erodes their surface and expose underlying hard objects. Consider now the force cattle make on this surface, and the resulting pressure back on hooves that have already been softened by constant exposure to water. When cows walk however, they apply this pressure to two extremities at a time, increasing the pressure per square inch. 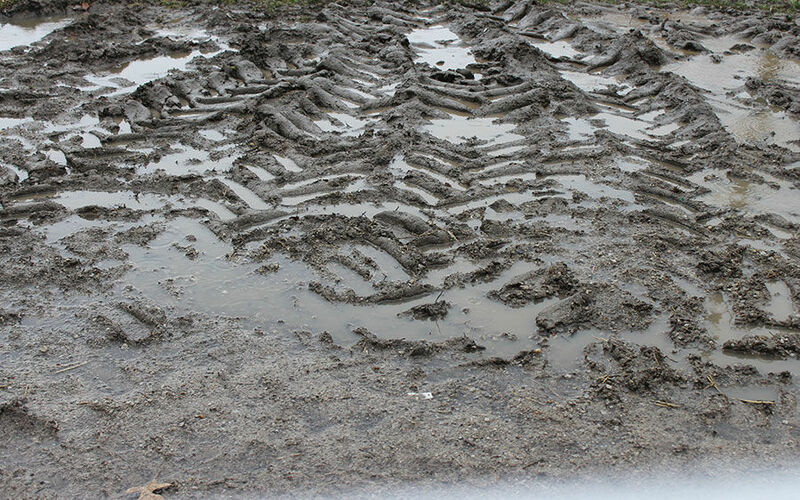 As a result, cow’s extremities sink deeper in the mud, often reaching the subajacent hardened surface, which could have hard objects not visible at plain sight. Although not as prevalent as lameness in dairy cattle, there are infectious agents (i.e. Fusobacterium necrophorus and Bacteroides melaninogenicus) that can cause cattle lameness, foot rot and digital dermatitis or hairy heel warts. Warts are most likely caused by Spirochetes, which is still one of the leading causes of lameness in the United States. Beef producers should manage cattle by attempting to keep hooves as dry as possible. Because this is difficult on most farms, particularly during spring or in unusually wet years, it is important to find ways to reduce the incidence of injuries to the hoof. This can be accomplished by periodically walking the pens to remove foreign objects and being careful with the type of material used to reshape the mounds.